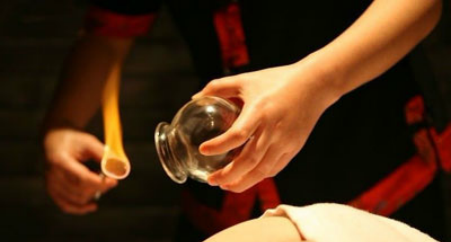 Cupping therapy used to clear heat from the body, eliminate toxins, treat respiratory ailments such as asthma and bronchitis, alleviate arthritic symptoms, ease lower back pain, resolve depression and lessen gastrointestinal problems. How Does Cupping Work? The cells of the body use oxygen and give off carbon dioxide. When the energy is blocked, the cell waste or carbon dioxide gets blocked. When toxins or cell waste stagnate in the muscles or joints, it can be very difficult for the body to get rid of this waste, causing further blockage, discomfort and pain. Cupping suction technique designed to pull the blockage out of the deeper tissue and move it to the skin’s surface. Once on the surface, it is much easier for the body to eliminate toxins through the superficial blood supply or capillary system. In only ten minutes of cupping, not only can we pull toxin build up out of specific areas, but we can also pull the fresh new blood into those areas, which will vitalize and restore proper blood flow. Tui-na means "pushing - pulling," and is a powerful form of Chinese medical bodywork. Based on the same Oriental medical principles as acupuncture, tui-na seeks to improve the flow of qi through the meridian channels. Tui-na is particularly effective for conditions involving muscles, tendons and joints, such as structural misalignment, orthopedic problems and sports injuries. It can also be used to treat internal diseases. Gua Sha is an accessory healing technique that involves palpation and stimulation where the skin is pressured, in strokes, by a round-edged instruments. The goal is to relieve stagnation and promote circulation and metabolic process. Typically used in the treatment of acute infectious illness (ie the common cold), upper respiratory and digestive problems, Gua Sha provides relief from pain, stiffness, fever, chills, cough and nausea. TDP Far-infrared Mineral Lamp Electromagnetic Health Lamp (TDP) is a new type of therapeutic and health device. With the functions of promoting metabolism, regulating physiological deficiency, diminishing inflammation and easing pain, the TDP Lamp has proven extraordinarily effective in treating numerous ailments such as muscular aches and pains, soft tissue injuries, arthritis and various skin conditions. How the TDP Lamp Works? The TDP Lamp features a round plate coated with a proprietary mineral clay formation consisting of 33 earth elements essential to the human body. When activated by the built-in electric heating element, this mineral plate emits a special band of far-infrared waves ranging from 2 to 25 (microns) in wavelength and 281034 mw/sq. cm in intensity that coincide with the wavelengths and intensity of the electromagnetic radiations emanating from the human body. As a result, the TDP far- infrared waves are readily absorbed. It is intended to emit energy in the infrared spectrum to provide topical heating for the purpose of temporarily elevating local tissue temperature and to use for the temporary relief and relaxation of minor muscle and joint stiffness. The heat generated is constant and very soothing to muscles and joints.